The Davey O’Brien National Quarterback Award Marquee Matchups for week 10 of the college football season feature top-25 battles with highly touted signal-callers in the Big 12 (TCU at West Virginia), SEC (Auburn at Ole Miss) and Pac-12 (Arizona at UCLA). TCU junior Trevone Boykin, the reigning Davey O’Brien Quarterback of the Week, has passed for 843 yards and 10 touchdowns over the past two games. He currently ranks third in the nation in total offense at 382.9 yards per game while guiding the country’s highest scoring team (50.4 points per game). Clint Trickett is one of just two players nationally to win the Davey O’Brien Quarterback of the Week award twice in 2014. The West Virginia senior currently ranks among the nation’s top 10 in passing yards (2,763), total offense (336.1), completions (218) and completion percentage (.683). 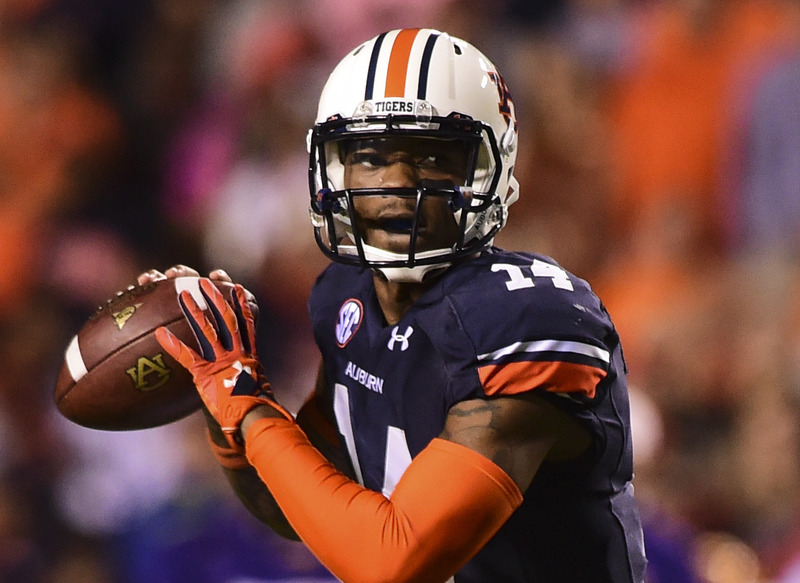 Nick Marshall has amassed 581 rushing yards and seven touchdowns to go along with 1,103 passing yards and 11 touchdowns this year. The senior owns Auburn’s quarterback record with eight career 100-yard rushing games and is looking to become the first player in school history to rush and pass for more than 2,000 yards in a career. Bo Wallace has helped Ole Miss to a 7-1 record and top-5 ranking and is on pace to set the school’s single-season records in pass efficiency and yards per attempt. Through eight games, he has totaled 2,075 passing yards and 18 touchdowns. The senior owns 10 career 300-yard passing games, tied with Eli Manning for most in school history. Arizona’s Anu Solomon ranks among the NCAA’s best in total offense (5th, 374.4), completions per game (5th, 28.6), passing touchdowns (12th, 20) and passing yards (12th, 2,430). The freshman has twice tossed five touchdowns in a game, including last week, and has just four interceptions in 316 passing attempts. Brett Hundley needs just one touchdown pass to become UCLA’s all-time leader in that category. The junior is listed second nationally in completion percentage (.708) and 13th in passing efficiency (157.6). He has topped the 400-total yard mark three times this year and has accounted for 19 touchdowns (14 passing, five rushing).